Gdynia is a young, modern and vivid city, inhabited by about 250 000 people. With the neighbouring cities of Sopot and Gdańsk, Gdynia makes a thriving agglomeration of nearly 1 million. Gdynia is a port city, well connected to other parts of the Europe and easily reached by car, train, bus, plane, or by sea. The city’s transport policy is aimed at solving the most important communication problems of the city in a sustainable way – by increasing bicycle use, co-modality and enhancing public transport services. The city has a modern and efficient urban transport system being easily accessible also by persons with limited mobility. The bicycle has also grown in popularity in recent years. 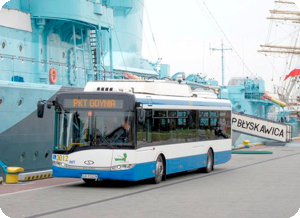 The city is also introducing Intelligent Transport Systems (ITS), which will contribute to a much more multimodal, safer, faster and greener transport in Gdynia and which demonstrates an innovative approach for Poland.